MetaMovie - The perfect way to add all information about your movies and fantastic cover art to your iTunes library. MetaTV - Add all important information and cover arts to your TV shows and give them a professional look in iTunes. MetaCopy - There is no better way to copy your iTunes information from one movie to another. 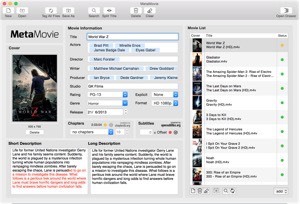 If you build you own movie library in iTunes, then you want it to look perfekt. Imagine to have all information about the movie at hand - actors, release date, directors, overview ect. And of cause you want nice looking cover arts for your library. All this brings MetaMovie to your movies. Just put your movies into the movie list, start the title search and then you need one more klick to bring all the Information to your movies. With MetaTV you can add very easily information about TV shows and cover arts to your video files (.mp4, .m4v). Simply drop your video files on the episode list of MetaTV, search for your TV show, select the right season and press copy. MetaTV loads all information about your episodes like air date, actors and overview together with cover images from the TVDB. With one further click you can add all the information to your video files. 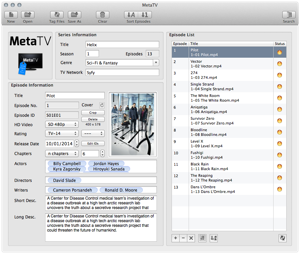 Import your files to iTunes and experience the professional look of your TV shows made by MetaTV. 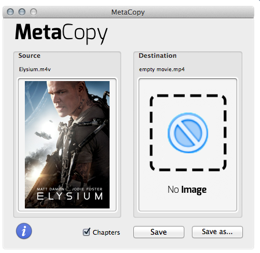 If you are looking for a simple tool to copy your iTunes-meta-information from one file to another, then have a closer look at MetaCopy. For example if you recorded a better version of one of your movies of your personal movie database, then you don't want to enter all iTunes information again. With MetaCopy you simply drag & drop your old movie to the left side and the new one to the right side and press the "Modify"-button, simple as that.